There is still time to join the Solids FQ Swap. See the Block of the Month tab for more information. Bring your finished Habitat Challenge blocks too! And don't forget your camera. Anna is going to be at a family reunion this weekend, so the sew-in scheduled for Saturday the 17th is cancelled, but instead we have two fun trips to offer Guild members. Liz has offered to take another group at 11:45am if that works better for you. All personal contact info was e-mailed on Wednesday, so be sure to check your SPAM boxes in case you'd like to call about the events. If you didn't receive the newletter and would like to be added to the list OR you have other questions, please e-mail Anna Looking forward to a fun weekend of fabric and quilts! Recently, our guild treasurer, Liz, was personally effected by the Bastrop wildfires when her parents were forced to evacuate the area. 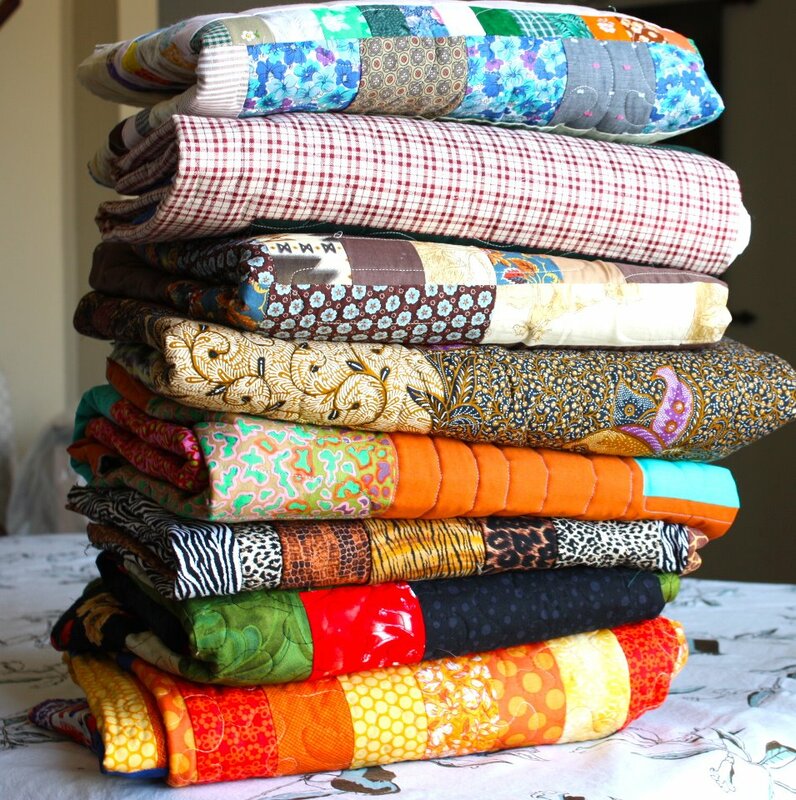 (Bastrop is roughly an hour outside of San Antonio) She reached out to our guild to help with completing quilts tops and getting them quilted to donate to the New Braunfels chapter of Project Linus which was collecting quilts for the Bastrop shelters. Another member of our guild, Danielle, who has a long arm quilting machine, immediately organized a quilting day at her home through e-mail and our Facebook page. (see her post about it here) The result (so far) was these amazing quilts being finished and ready to donate! Some were collected from the Project Linus group, tops and backs for them to quilt, the others were donated from the chapter members. Danielle has planned another Blankets for Bastrop quilting day on Tuesday September 20th. It's truly satisfying to know that our group can organize so quickly and be able to help in such a tangible way. If you'd like more information about helping with the Project Linus Blankets for Bastrop effort, please leave a comment here and let us know! Also don't forget to join our Facebook Group if you're interested in our guild. It's the best place to get the most current information about guild meetings, outings and projects.